Birds, butterflies and bees rely on trees and plants for food and shelter. With a thoughtful design and the right mix of plants you can not only attract birds, bees and butterflies to your garden but also make sure that they keep coming back to your garden. Birds source their food from native plants and trees. Some birds prefer seeds, some like fruits and berries, and some are attracted to insects. 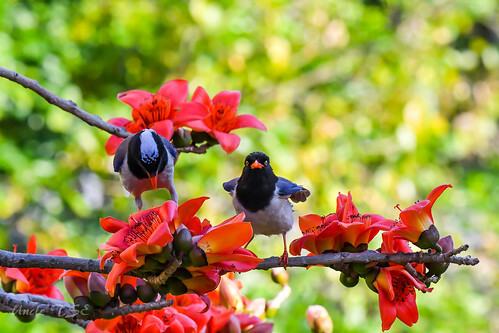 Therefore it is important to plant the right mix of plants and trees to attract a variety of birds. Birds also need safe nesting places. So you should consider growing plants and trees that provide shelter from environment and pets. If you are not already growing native plants in your garden, consider including native species. They are not only low on maintenance but a reliable source of food for birds. It is a good idea to grow a mix of native plants for different seasons so that you can offer food and seeds to the birds throughout the year. To supplement plants and trees, you can also add a birdfeeder in your garden to attract seed-loving birds. Placing a water pot during hot months of the year is also a good idea. If you are more interested in attracting butterflies to your garden, grow nectar producing plants and shrubs. Like birds, butterflies also need water and protection from environment so placing fresh water, and butterfly boxes in the garden will attract more butterflies and bring them back throughout the year. To attract bees to your garden, make sure you create a congenial environment for them. Bees need not only nectar but also a sheltered place to nest. Some species nest in the ground. Using a lot of mulch in your garden will be a big deterrent. Make sure that you have loose ground where these species can rest undisturbed and make their home. Some species like to nest inside deadwood. Some bees rest inside hollow stems. When you cut back shrubs and plants in the fall season, make sure that you cutback shrubs and plants in the fall, make sure you leave behind approximately a foot-long length of hollow stems. Fallen wood and old wooden fence also provide a safe nesting place for bees in your garden. You can also create a safe nesting place for bees by bundling together hollow stems and hanging them in you garden. Avoid pesticides. If you really need to use a pesticide, use an organic pesticide. Plant a variety of flowering plants, shrubs, trees and bushes so that your garden has food and shelter in all seasons. If you have pets, make sure that birdfeeders and butterfly boxes are out of their reach. Choose a range of flowering shrubs, annuals and perennials of a variety of size and color to attract more and more wildlife. Place water pots in a sheltered and safe place for birds and butterflies especially during summer. Here is a list of common plants that attract birds, bees butterflies. The placement of your garden furniture can make or break your garden. 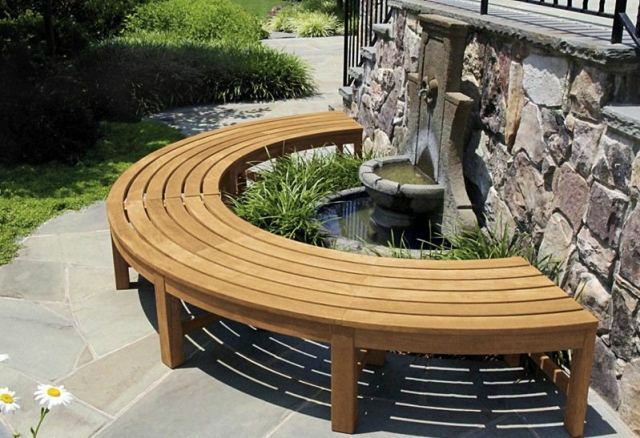 Having a bench in the right place can enhance the enjoyment of your garden or it can show you all the flaws. It is therefore important to make sure that your garden furniture is in a place that is comfortable and shows your garden in its best light. If you are much organised, you will have thought out your furniture placement before you have even landscaped your garden. However, if you are not, and a garden bench was an inspired afterthought, then worry not. Sketching out your garden, either on computer software or good old pencil and paper, will help you to visualise what it will look like, whether it will fit, etc, etc. Try to draw it to scale, and make sure you note prominent bushes and trees. Make a note of the empty spaces where your table, chairs, loungers or garden bench will work. Go out into your garden and sit or stand where you have noted that furniture might work. Think about what your garden looks like from this angle. Consider the sights, smells and whether there are any overbearing trees that might provide shade on a different part of the day. Overhanging trees might make the maintenance of your furniture that little bit more difficult, and attract insects such as midges that you might not want if you are eating or relaxing. You should also take into consideration whether you can see into others’ gardens and whether they can see into yours. Take a measuring tape and plan out where they might sit. The largest pieces of your furniture should go in your garden first. A dining set or a garden bench might be the focus of your garden if you place it in the middle, but may look crowded if you add another piece. If you place it to one side, your garden may more easily accommodate more furniture. Once you have placed the main pieces, then you will have a better idea of where the smaller pieces will look good. Like any other room, it will not look complete until the finishing touches are there. Whether it is garden lights, water features or birdfeeders, you will only be happy when you have placed your new dining set or garden bench with the accessories that set them off perfectly. 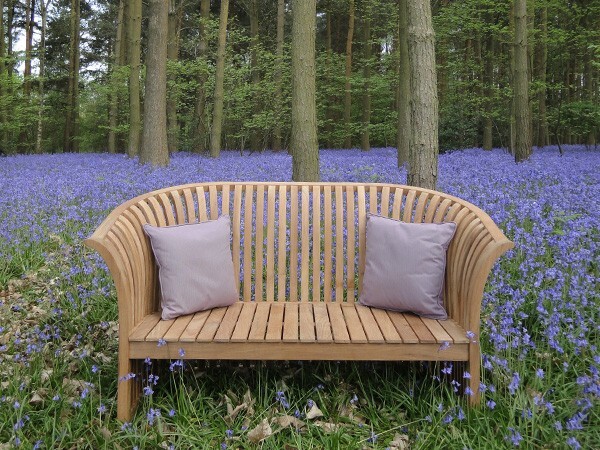 If you think that you are garden would look better with a bench, check out The Garden Furniture Centre Ltd for a wide range of stylish garden benches and other furniture suitable for every style of garden. 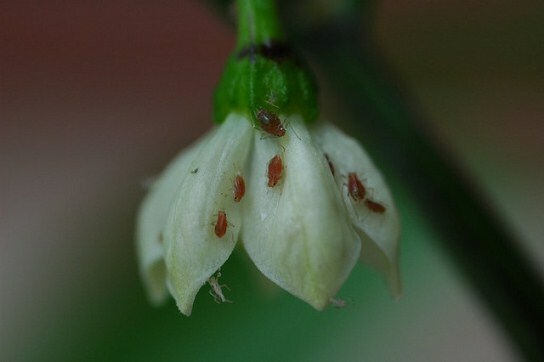 Aphid is one of the most common and troublesome garden pests. It damages plants especially the new growth by sucking the essential sap of the plant. Aphids also develop a sticky honeydew that encourages the growth of mold and virus. An easy and natural method for controlling aphids in the garden is planting Tagetes as companion plant. The smell of Tagetes attracts hoverfly that feeds on aphids. Hoverfly also lays eggs on aphids that become food of larva that hatches out of the eggs. Cinnamon powder is an effective fungicide that can be applied directly on cuttings or damaged parts of the plants. You can also mix cinnamon powder with cooking oil and preserve the paste for applying on cuttings or affected parts. Another way of using cinnamon as fungicide is preparing a concoction of cinnamon (2 tablespoons) and isopropyle alcohol (just a pint is enough). The mixture should be kept overnight and then filtered and used as organic fungicide spray. Scale appears as hard ovals of brown color on woody stems or underside of leaves and damage plants by sucking essential sap. Scale is hard to combat when it reaches it maturity. Hence it is important to get rid of it at early stage. Scale on small plants can be removed by brushing with an old tooth brush. Large plants can be sprayed with methylated spirit (50% diluted with water). Spray every ten days until scale is completely removed. Ants are majorly responsible for the growth of scales. Therefore, it is important to combat ants as well. An easy way of dealing ants is introducing small saucers (like jam jar tops) filled with 1 tablespoon of borax with 4 tablespoons of sugar diluted in 250 ml of warm water . This solution would attract ants that would consume the liquid and then go back to die in their nests. Avoid buying a plant in bloom. When you buy a new plant and move it to your home or garden, it requires sufficient amount of energy to adjust to new conditions especially when you are transplanting it. If the plant is already in bloom, it would continue to finish the blooming cycle instead of establishing itself resulting in poor health. If you have to buy a blooming plant, it is better to nip the buds and blooms so that that plant can use its energies to acclimatize itself. Once established in its new place, the plant would produce healthy foliage and prolific blooms in the next blooming season. If you are desiging a low maintenance garden, do not forget plants that are still establishing. They need to be watered well. Top the soil with mulch; it retains water and protects the soil from drying effects of wind and sun – thus keeping the plant sufficiently moist and low on maintenance. If you do not want to purchase commercial organic mulch, use shredded leaves, wood chips or rounded gravel to top off the soil. Pests are uninvited guests to the garden but spraying them furiously is not the right way to remove them. You have to be cautious when selecting a pesticide as most of the pesticides would kill nasty as well as friendly pests. Hence the best way to control pests is to prevent them from establishing and growing in your garden. Spraying insecticide should be the last resort. The following are some useful and natural ways to prevent pests is your garden. Keep your garden clean – Always keep your garden free from weeds; they might attract unwanted pests in your garden. Remove debris; it might become safe haven for pests. Do not allow unwanted parts of plants to decay in open. Either remove them or use them to prepare your own compost. Provide the right spots to the plants – Provide your plants with the best growing conditions. Plants that require sunny conditions should be planted in place where they receive good amount of sunlight for most part of the day. Plants that do not get the right growing conditions are more prone to diseases and pests. Try to grow native plants that are easier to keep healthy and strong; avoid plants that are difficult to grow in your climate unless you can spend time and effort to keep the healthy. Prepare the ground well – Whether your plants grow in the ground of in containers, provide them with a balanced and well-prepared soil. Whatever is the type of soil your plants prefer, make sure that it contains the right mix and comes from healthy sources. Do not reuse soil that comes from a diseased plant. Frequently change location – Try to rotate growing spots especially if you grow vegetables or annuals. Growing the same plant is a spot for years raises the chances of insects to invade and establish them slowly. Keep your plants healthy – Healthy plants are more resistant to pest attacks. Provide your plants with the right amount of water, light and fertilizer. Plants that get scrappy should be removed or at least separated. Understand and diagnose – Understand growing habits of common pests to prevent them from appearing. For instance, there are some insects that propagated in boggy soil. You can prevent them by keeping the soil from becoming boggy. Pests that grow underneath leaves can be diagnosed by regularly examining your plants. When a branch of leaf is affected, remove it immediately. Spraying insecticide should be the last option. Dispose affected parts off properly. 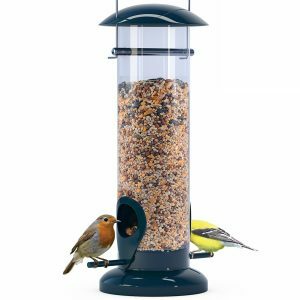 Attract birds and keep friendly pests – There are a number of garden birds that feed on insects. Place a bird feeder or grow plants that attract birds to garden. Friendly insects like bees, ground beetle, hover fly and ladybeetles discourage the growth of harmful insects. You can also purchase them to release in your garden. In my previous post, I shared useful tips for designing a low maintenance garden landscape. Today, I am introducing some unusual plants for garden landscapes. These plants are unusual because of their extra-ordinary shape and formation. 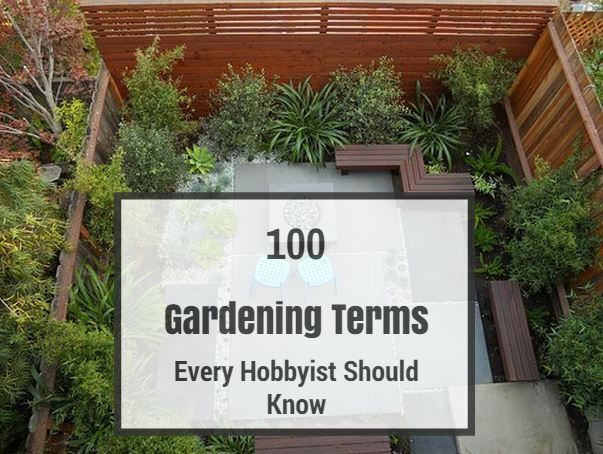 Almost all of these unusual plants are hardy, evergreen and require less maintenance. Before I introduce these plants, the question is why select unusual plants when you have a huge variety of plants for your garden landscape? The answer is simple. Unusual plants are for unusual people – enthusiasts and experimental gardeners. There are a number of unusual and stunning plants in the universe but I would limit to just five of them. The plants in this list are easy to grow and can be used as nice companion plants in your garden landscape. Beaucarnea recurvata or Ponytail Palm is an unusual plant because of its unusual and very noticeable caudex which is used to store water and food. Typically Beaucarnea develops a tuft of long and strappy leaves that emerge from a bulbous stem. Because of its palm-like leaves and swollen stem, it is also called ponytail palm and sometimes Elephant Foot Tree. Beaucarnea is considered one of the easiest houseplants to grow. It can be grown in garden containers as well as in landscape. The plant requires bright sunlight and preferably direct sunlight for some part of the day. Since it is native to the deserts of Mexico, Beaucarnea does not require much water. Water only when the soil is dry; excessive watering would damage the plant Fertilize Beaucarnea plants regularly during spring and summer. Beaucarnea loves well drained soil and warm climate; protect it from extremely cold weather and frost. Beaucarnea is unusually slow plant. Though it eventually gains a height of more than 15 feet but it takes more than 10 years. 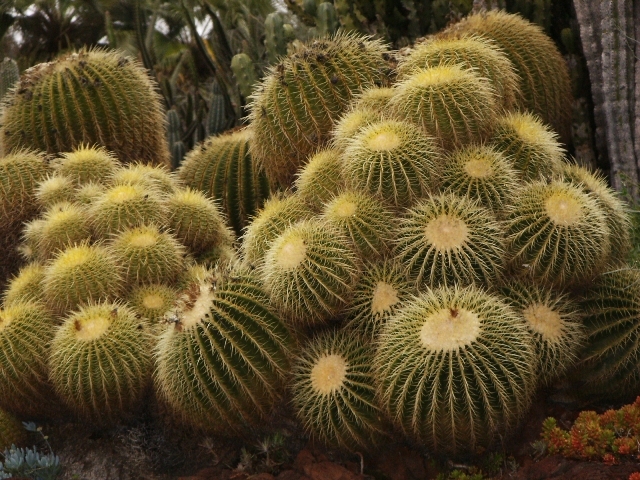 Echinocactus grusonii or Golden Barrel is one of the most widely grown commercial species of cactus. It is an easy to grow plant and can be used as companion plant in many types of garden landscapes. It remains solitary and assumes the shape of a big, fat ball until it mature; at maturity it tends to form a cylindrical shape. Echinocactus grusonii is unusual because of its striking shape, spines, crown, flowers, and ability to survive long droughts. Golden Barrel requires bright sunlight and warm, humid climate. However, it can withstand cold weather and small spans of freeze. Like Beaucarnea, Echinocactus grusonii is a hungry plant and requires regular fertilization. 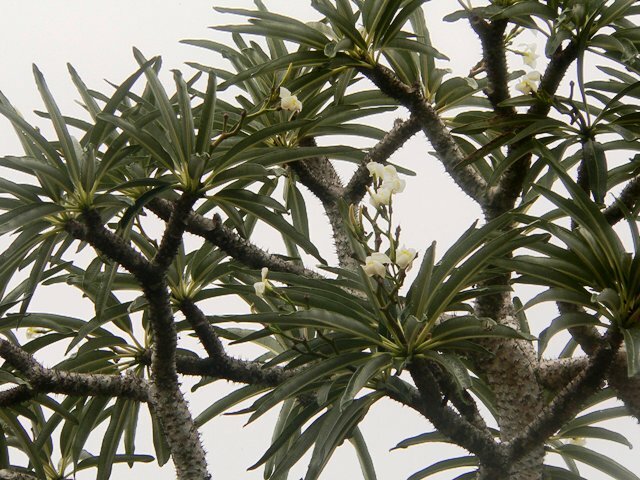 Pachypodium lamerei or Madagascar Palm (it is not a palm) is a tree-like succulent plant with a thick, grey stem that is completely covered with spines and topped with palm-like leaves. The unusual formation of Pachypodium makes it a perfect choice for rocky or experimental landscapes. It can gain a height of more than 15 feet in tropical climates. Pachypodium belongs to Southern Madagascar. It loves well-drained but somewhat rich soil. The plant sheds its leaves during winter; during this phase it does not require much water. This weird looking plant produces delicate white and yellow flowers at maturity. Pachypodium does not like spells of frost and cold weather. 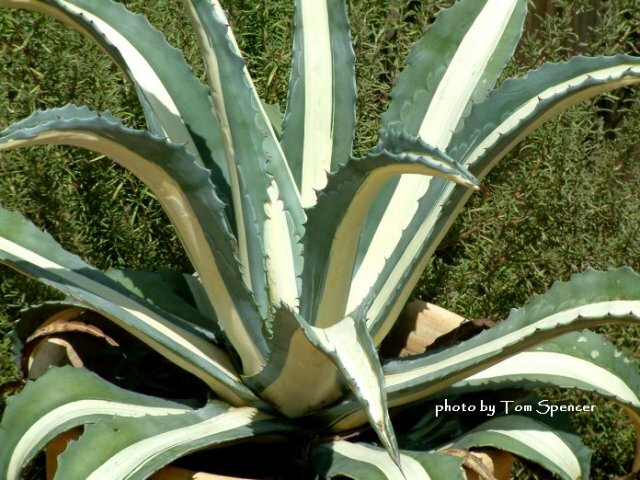 One of my prime choices for landscape gardens, Agave americana var. Medio Picta can dramatically change and enhance the overall effect of your landscape garden. It is a rugged plant but adds unusual colors and shapes to your garden landscape as a companion plant. It produces a nice rosette of fleshy leaves with teethed edges and stripes of green and creamy white color. Agave Americana var. Medio Picta prefers bright sunlight and moderate watering. 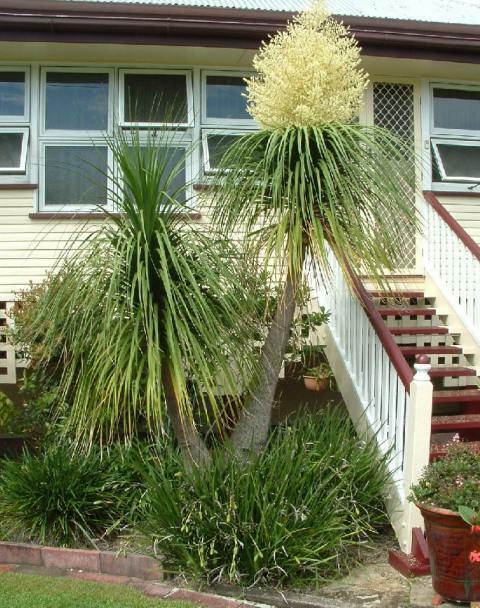 The plant can live up to 35 years and gains 90-120 cm in height. Zamia Furfuracea is a slow growing plant and makes unusual foliage of thick and hard texture, that is why, it is also called Cardboard palm. 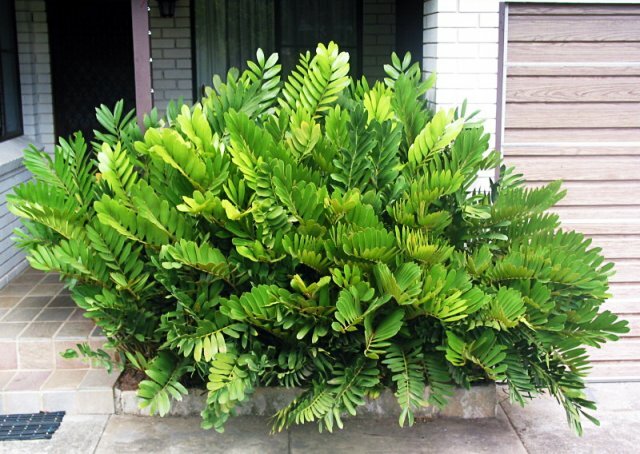 Zamia likes bright sunlight, moderate watering, and some fertilizer in spring. The color of leaves ranges from olive green to dark green. A mature plant can grow as large as 3-4′ in height and 6′ in diameter with a heavy trunk that acts as water reservoir during drought. It is quite a hardy plant and makes a good choice for landscapes because of its hardy and drought-tolerant nature. If you would like to add more entries to this list of unusual plants, do share your comments. I will review and feature those unusual plants on this website.